ifoAppleStore’s Gary Allen alleges that John Browett, head of Apple Retail, felt the stores were “too bloated”. He cites “numerous tipsters” that Browett ordered a reduction in the number of employees. As the information on employees and visitors is public, we can quickly test the assumption. 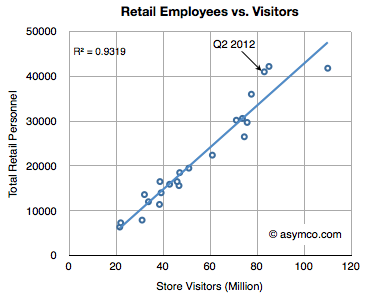 The following graph shows the relationship between Retail employees and Visitors on a global basis. The total figure for the last quarter was 41,000 employees for 83 million visitors. This is above the expected ratio as shown by the line shown in the graph. Reversion to that line would imply that about 35,000 employees should have sufficed during that quarter. However, Apple’s business is cyclical and employment is not–or at least not on the same frequency of cycle. During a slow, transition quarter, there will be over-employment and during a rush holiday period there would be under-employment. Consider the right-most point in the chart. It represents Q4 2011 when there were 110 million visitors and only 800 more personnel than during the last quarter. 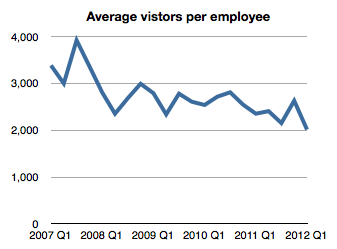 Overall, this ratio of visitors per employee has been relatively steady, though declining. Perhaps the company should check this decline. Perhaps the company has not been able to match demand with supply as well during the last six months. Perhaps they are overstaffed. However, I doubt that there has been a decision to reduce the overall level of service offered. Or that service is not paramount. The accusation that employment is being sacrificed for the sake of profits seems disingenuous. The stores were never designed as a profit center. They have to be profitable in the sense that they have to justify themselves. But we need to recognize that they rely on a brand and product mix that is unique to that store. In return, they are designed to sustain that brand and offer a service rather than merely a sales channel. For the head of the division to misidentify this fundamental purpose for the operation would be catastrophic and I would expect a lot more evidence to support such an extraordinary claim.